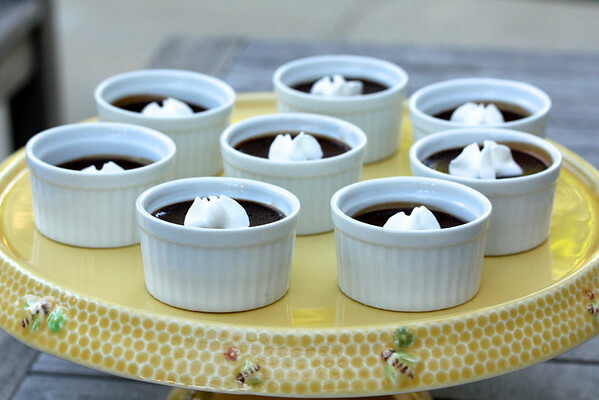 These mini chocolate espresso pots de creme are the perfect ending for a dinner party. Each serving is only 1/4 C, so there is no reason for feeling guilty for having dessert, yet their flavor is amazingly rich. They are perfect served with a cup of coffee or a digestif. They are as dark as espresso and full of bittersweet chocolate. There is only 1 tablespoon of sugar added to the mixture beyond what is in the chocolate. I like to serve them with a bit of whipped cream on top and a demitasse spoon. If you really want to be elegant, you can serve this in espresso cups and saucers. How fancy is that? Adapted from Bite-Size Desserts: Creating Mini Sweet Treats, from Cupcakes to Cobblers to Custards and Cookies by Carole Bloom. Equipment needed: 8 2 1/4 inch ramekins or espresso cups. In a 1 quart saucepan, bring the heavy cream and espresso to a boil, whisking to dissolve the espresso. Remove the pan from the heat, add the chocolate, and whisk until all of the chocolate is fully incorporated. It sometimes will take a while. Preheat the oven to 325 degrees F with a rack in the middle. Using a stand mixer, hand mixer, or a whisk, mix the egg yolks to break them up. Add the sugar, vanilla, and salt and continue whisking until well blended. Slowly add the chocolate cream mixture while whisking/mixing constantly to thoroughly blend the ingredients. Strain the mixture into a 2 cup measuring cup. Divide the mixture evenly among the 8 ramekins. Place the ramekins into a quarter sheet pan or a 2 quart casserole and bring 2 to 3 cups of water to a boil. I usually do it in a large Pyrex measuring cup in the microwave. It makes it easier to poor into the pan. When the water is boiling, pour it into the baking pan so that it comes about half way up the sides of the ramekins. Cover the pan tightly with foil and carefully place it in the oven. Bake for 25 to 27 minutes, until the sides are done but the middle is still slightly soft. Cool the ramekins on a cooling rack. At this point, you can serve them warm if you like for a soft dessert. To serve cold, once they have cooled, cover loosely with wax paper and then cover tightly with plastic wrap. Chill for at least 2 hours. They are great for making ahead of time. Serve with a tiny spritz of whipped cream. Looking so creamylicious...I am a big fan of pot de creme and yours looks to die for! Oh, boy, Karen! These would bring a big smile to my family member's faces! Aaa, coffee and chocolate - it's an unbeatable combination! I love your photos, and I'm so jealous of your yellow bee tray, it's beautiful! The hostess-with-the-mostest genius idea, Karen, to serve these delights in espresso cups. Of course, they look dinner party ready in the ramekins, too. Thank you for this recipe! So cute and scrumptious! I know if I made these I would eat at least three of them. 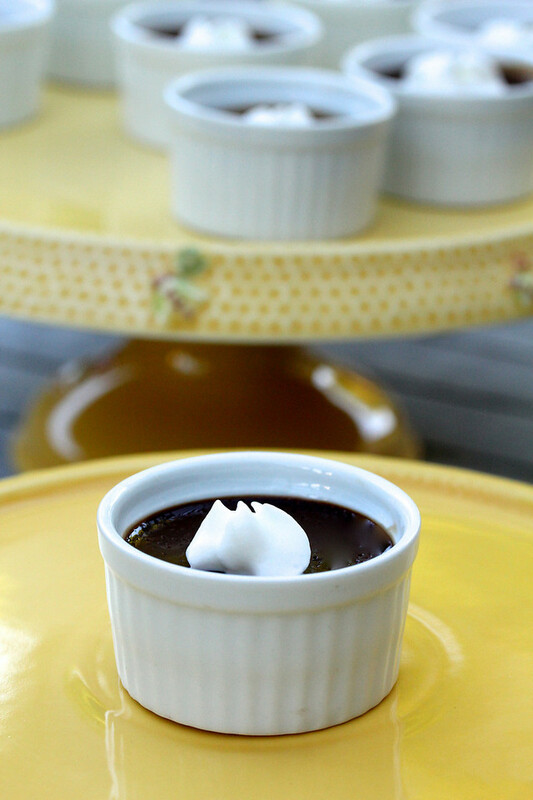 I have never tried pots de creme but it sounds amazing! Don't get me started.... when they are small it doesn't count, right? I so fall in love with cake plates. Thank you Anne! Oh such a beautiful dish! Thank you!!!! I even had one for breakfast. Oh my...I love chocolate and espresso together. My favorite combo. Cant' wait to try these decadent pot de creme. 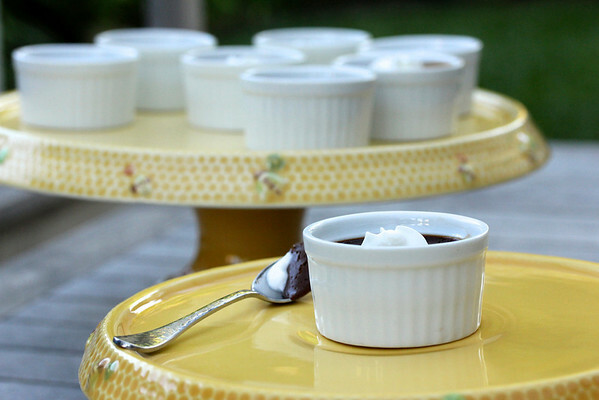 Those look sinfully sweet :) I've always wanted to try pots de creme! I love the idea to serve these elegant deserts in espresso cups! Thanks for sharing them with the Chocolate Party! Thanks Roxanna! Thanks for creating the party! I made this for April's SRC. They were amazing. I pretty much had to hide it from my husband before dinner. I will definitely be making this again. What a wonderful idea! I try to limit desserts, but this looks like the perfect size to not feel too guilty! yum! Such a perfect party dessert! Yum! The perfect, delicious after dinner dessert, I am going to be trying these. I'm definitely not a pudding person but certainly am a coffee person so the bitter chocolate coupled with espresso and just a spot of sugar sounds perfect for me! Sounds like a lovely recipe; and I see you have lots to share. :) I love your honeycomb cake tray! Um...#chocolateparty? I'm in :) Love this recipe, and your photos Karen! 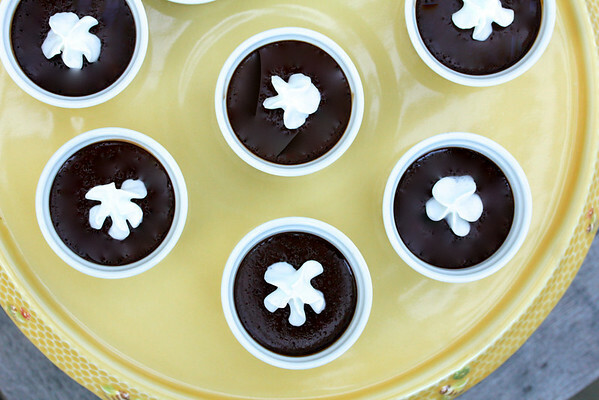 I love desserts like this for entertaining - they are the perfect size!